Model T Ford Forum: Period Photo - Loading Dirt. 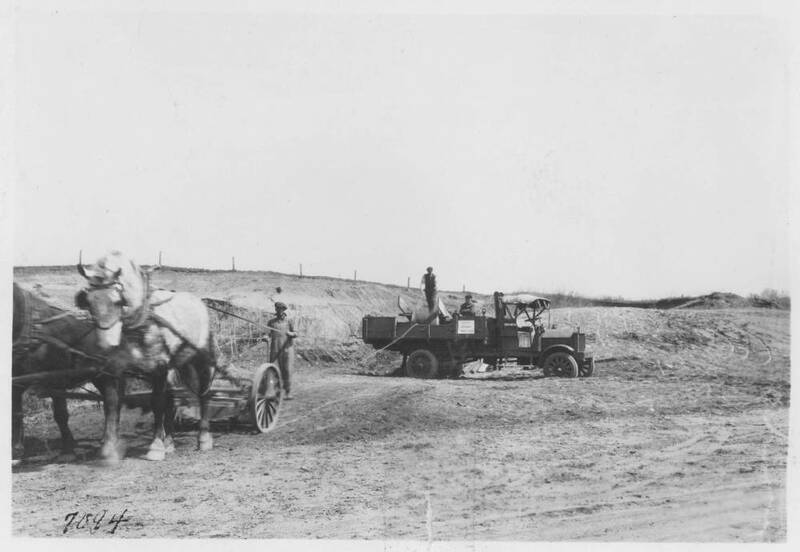 Period Photo - Loading Dirt. Model T Ford Forum: Forum 2010: Period Photo - Loading Dirt. At first glance it makes you wonder how could a man slide that much dirt up a wooden ramp in one pass. Here's what's happening on the other side of the truck. 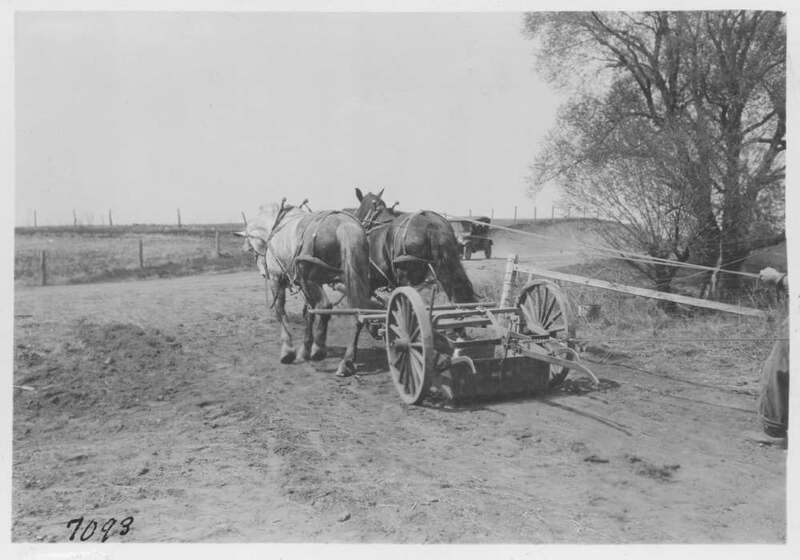 Notice the cable hooked to the chain on the horse drawn slip. I would assume between loads the horse drawn slip operator would pull the pin, unhook from the cable and go back around and scrape some more dirt loose for the stock pile. Seems like a lot of work but it would sure beat the alternative of scooping it on by hand. I took a load of shelled corn in an enclosed semi trailer in the 60's to a chicken farm in northern Georgia and they unloaded the corn that way only they used a CJ5 Jeep. When I was a wee lad I remember my dad using this method to dig out a basement under our house. They used a car or a doodle bug. This was about 1941 or 42. It is fascinating studying the old pictures to see just how they were doing what they were doing. I never cease to be amazed at the ingenuity of our forefathers. Who was it that said that "Necessity is the mother of invention". I remember my grandfather (1898-1974) was always a innovator. He told me many times to "work smart, not hard". He had all kinds of innovations around the farm to make life easier. Like the first electric lights in the community made from a car generator, designed, patented, and produced a well pump. 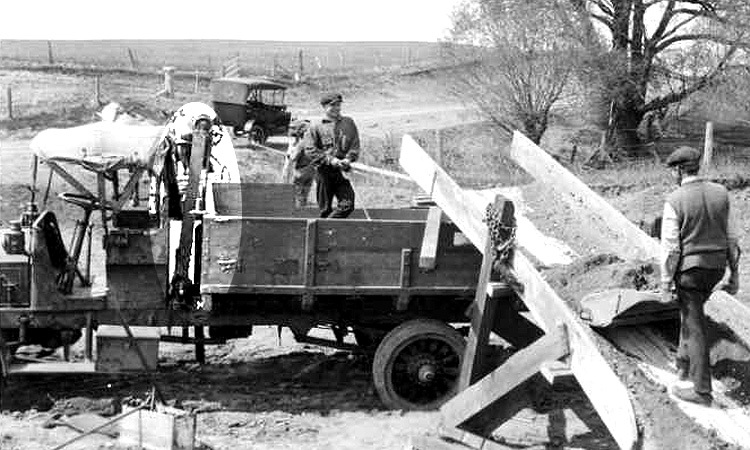 He also rigged a sort of early day fork lift for the rear of his tractor to raise hay up to the top of hay stacks and the list goes on and on. I guess he was not too different from other folks of the day, in that if you needed something, you built it. 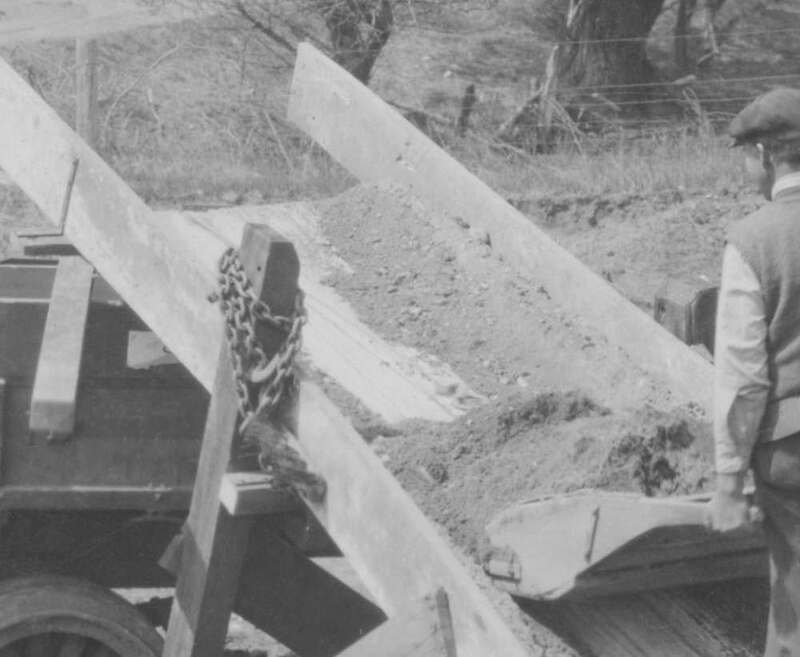 We dug a root cellar on my farm using a slip scoop in the mid '70s. I pulled it with my Allis-Chalmers WC tractor. The job went fairly quickly. Had it done in an afternoon. 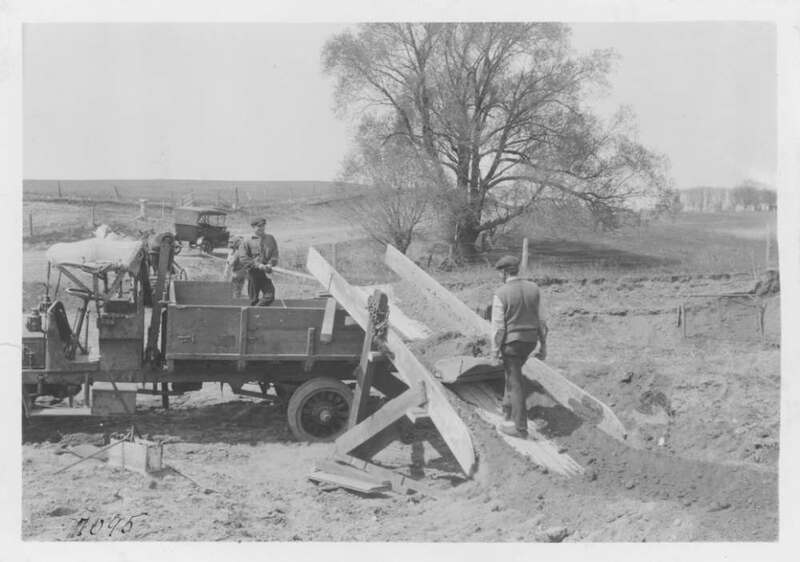 In the late '30s I watched a fellow with a team dig a basement for a house in one day. When I was a kid, a guy who worked for my dad, told me "Always use your head instead of your hands and feet. I makes life a lot easier. 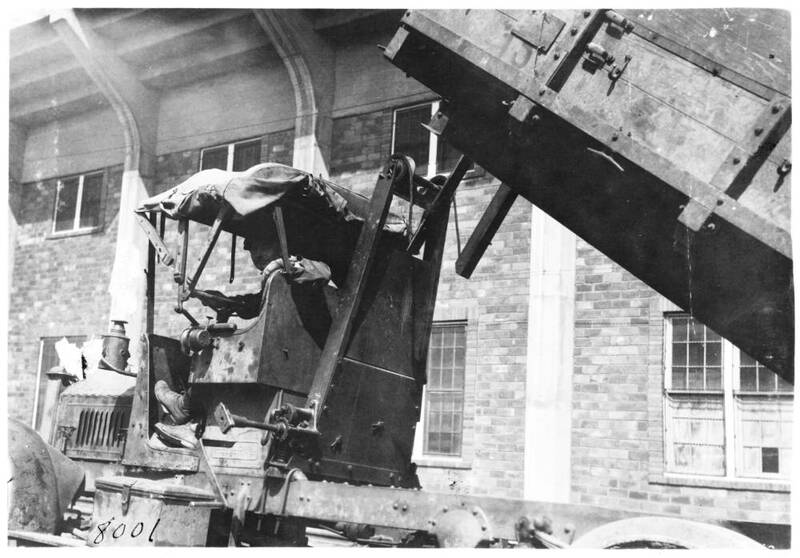 That appears to be a WW1 liberty truck. Speaking of innovation, my father was always tinkering and building new things. He built what I think was one of the first rotary lawnmowerws back in about 1948. He made a square wooden platform of plywood and 2/2"'s and mounted a saw mandrel vertcally in the front bolted to a homemade blade underneath. 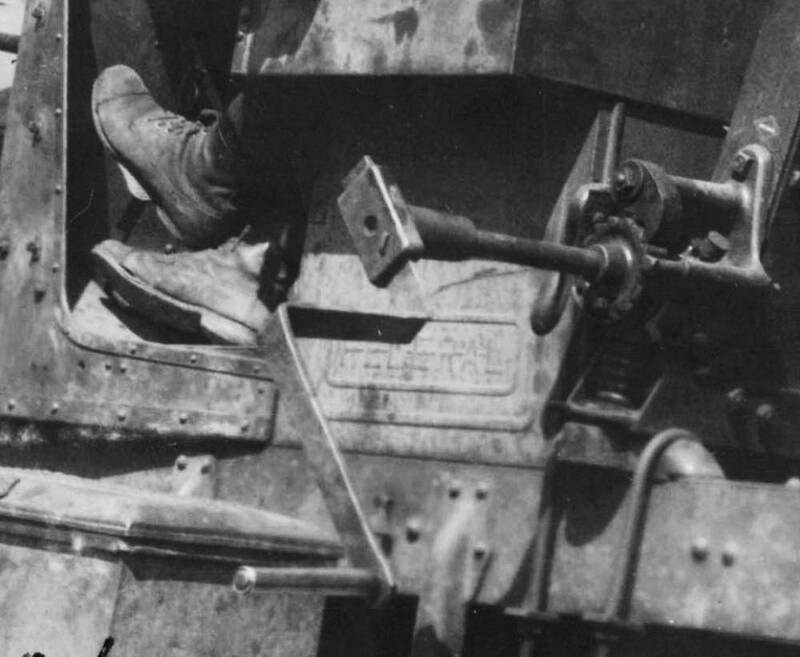 It was powered by a belt from a 2 cylinder maytag washing machine engine. 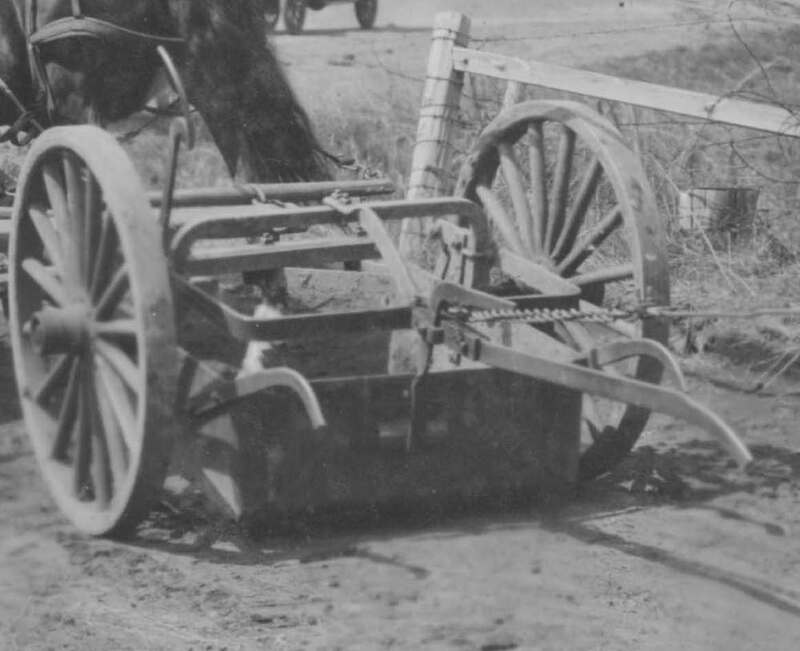 He used 4 wagon wheels and a push handle made of water pipes. The only safety feature was a piece of old binder belt nailed to the rear. The author of this proverbial saying isn't known. It is sometimes ascribed to Plato, although no version of it can be found in his works. It was known in England, although at that point in Latin rather than English, by the 16th century. William Horman, the headmaster of Winchester and Eton, included the Latin form 'Mater artium necessitas' in Vulgaria, a book aphorisms for the boys of the schools to learn by heart, which he published in 1519. Where's that picture of your TT dump and the steam shovel? My father added to that old saying. He said "If necessity is the Mother of invention then laziness is the Father. Notice in the closeup the man on the ramp does not have his thumb around the handle of the slip. I remember our old school bus driver never put his thumb around the steering wheel. I wonder if it is all from habit based on cranking. Truck could be a Liberty but has anyone noticed the the lift for the dump bed behind the cab? While you are at it, could you maybe walk around in front of the truck now and take a picture of the emblem on the radiator? Here's a few more pictures. The truck is a Federal. That's a great set of construction photos. . thanks for posting them!! 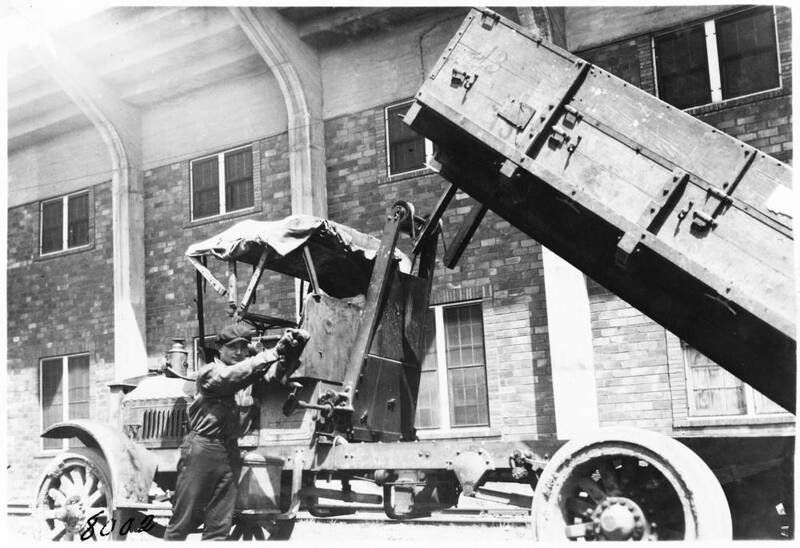 Please post more of these old trucks and things if you have time because they are very interesting to most of us because it not only shows old cars and trucks but gives little snips of everyday life back in the days of the model T.